Holder of a Scholarship 2004 from the Polish Ministry of Culture. He is the originator of the ”Multipoetry”; project, meant to transform the ways in which verse functions in the modern world. He was born in Warsaw, in 1964. In 1983, he began studing in the Department of Polish Studies at Warsaw University which he graduated from in 1987, with the degree of MA. In 1988, he was admitted to the Film Direction Department of the State Theatrical and Film College in Łódź. As early as his first year of studies, he was granted an award at the Sports Film Festival in Turin for his documentary movie The Point of a Blade. As a film college student, he also shot four short-feature films, a half-an-hour documentary (which was broadcast on TV two times), and a teleplay. In 1993, he was awarded the prize for the best lyrics of the year at the “Music One” TV show (the song called Hush And Hush). Grzegorz Turnau, Anna Szałapak, Beata Rybotycka, and recently – Agnieszka Chrzanowska, (the albums “Never Fear to Do Nothing”, and “The Whole World’s Burning”). In 1991, he wrote a set of 33 new song-lyrics for Jan Kanty Pawluśkiewicz’s score to the new adaptation of John Gay’s drama “The Beggar’s Opera” which had its premiere at the People’s Theatre in Cracow. In 1999/2000, this version of the play was also staged at the Teatr Dramatyczny in Warsaw. He scripted, directed and produced over thirty videoclips with songs based on his poems. His first clip, Hush And Hush, was granted an award at the “Music One” TV show in 1993 and came out second during the “Fryderyk Awards” Festival ’94. His half-an-hour musical film Here And There, which was shot in 1995, included seven videoclips and was broadcast four times on TV. It is needless to mention how many times the videoclips themeselves were presented on the telly. In the year 2000, he made another musical film, which was entitled Never Fear to Do Nothing (Agnieszka Chrzanowska’s songs with Michał Zabłocki’s lyrics) and introduced to the public dozens of times on various channels of the National Television. In 1996, the Świat Literacki (World of Literature) Publishing Company released a small volume of his poems entitled Consciousness Intensity. In April ’96, there was a concert held for the promotion of this book at the Teatr Rozmaitości in Warsaw, and all the artists whose repertoires included the author’s lyrics or poems took part in it. The concert was recorded, and later on it was broadcast on TV a couple of times. In 1997, another set of his poems was out on the same publishing company. The set was entitled ”The Void Inside”. In the year 2000, the “Poemat” publishing house released a collector’s unique series of riveted books which included six works by the author, they were: “Consciousness Intensity”, ”The Void Inside”, “All About Love”, “Your Decalogue”, “The Beggar’s Opera – the lyrics of the songs and arias”, “The Madmooners”. 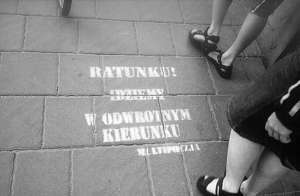 In 2004, the Świat Literacki Publishing Company released his latest book entitled “100 Short Poems” in a Polish-English version. The poems were translated by Zdzislaw Zabierzewski. Michał Zabłocki is the originator of the Poetic Revolution Manifesto “Multipoetry” – an action that has been started in order to transform the ways in which verse functions in the modern world. Within this manifesto, he has created lots of spectacular poetic initiatives since the year 2000. MULTIPOETRY is an authorized project by polish poet Michal Zablocki, that consists in seeking some new ways for poetry so as to let it exist in the contemporary world. Sentenced to slow death on the most forsaken bookshop shelves, poetry has lost its typical force and vigour. Two factors contribute to this disaster: incompetence in making special use of modern electronic media, and preferring the printed word to direct contact with the public. MULTIPOETRY starts a progressive revolution in the stagnant world of means designed to make verse, that is, poetry function for the reader. Firstly, it searches for effective methods to come into being within the present-day media, such as: newspapers, television, radio, Internet and some other non-standard techniques of communicating; and secondly, it searches for a way to come into direct contact with the public. MEDIA of today create a need to reform the poetic means of expression. Each kind of media requires a different form of presenting a poem, which refers to both the technical possibilities and the textual contents. Thus, MULTIPOETRY is not only a search for some new ways of transmitting all poetic matter, but it is also, or even mainly, a search for such a form of introducing a poem that can be appropriate for the particular media which are to present it. DIRECT CONTACT WITH THE PUBLIC also creates a need to reform the poetic means of expression, but first of all – to reform the ways of composing a poem. In case of cabaret poems and occasional ones, written to order, important are the poems themselves as well as the CIRCUMSTANCES of composing and introducing them. However, it is not the poem itself that is a work of art, but the SITUATION in which it is conceived. Poems on House Walls” is an authorized project, according to which Michal Zablocki’s successive poems, along with their English versions translated by Zdzislaw Zabierzewski, will be projected all the calendar year round (one poem each day) on the facade of the building located at 2 Bracka Street in Krakow, night by night, from sunset to sunrise. 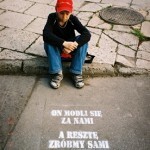 This action is patronized by President of the City of Krakow. Poems that are to be presented on walls must be characterized by specific form and content, which is why they will be specially created for the purpose of this action. The project itself is a completely new and unique idea, and it has not been borrowed from any foreign or past patterns. It remains part of its author’s multimedia action called “Multipoetry”, which is intended to revolutionize the general image of poetry in the landscape of contemporary media by making use of the Internet, TV, radio, press, cabaret, publishing initiatives and some non-standard activities. This project is an attempt to find some new space for poetry and an effective recipe for coming into direct contact with the public during the present reading crisis. 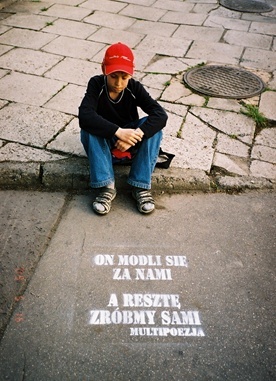 Our action, the beginning of which is to take place on January 1st 2006, will be the continuation of the previous activities in 2002/2003 when Michal Zablocki’s poems used to be for the first time projected on building facades in Warsaw and Krakow, all year long. The projections attracted much interest of the media, so we believe that if we keep them going it will make the entire enterprise even more popular. 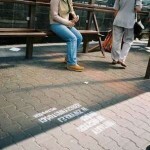 They are poetic stamps imprinted on the pavements of various towns. Each stamp includes a short poem with two or four lines. 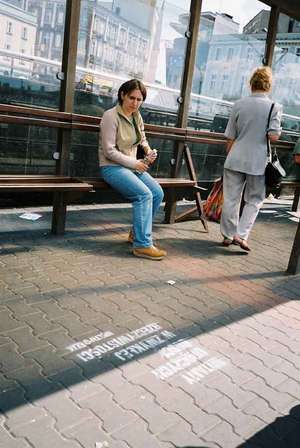 The first action of this sort was initiated in Cracow, in July 2002. In the spring of 2003, the action took place in as many as four towns: Cracow, Sosnowiec, Danzig and Sopot. In 2005 as many as 25 towns took part in the action. The Autor plans to develop the action in the forthcoming years. What seems specific about this Internet action for creating e-poetry, it is the fact that ”ON-LINE” verses are written systematically. The ONET.PL website is the host of the poetic chats featuring Michał Zabłocki. Every fortnight, in the Multipoetry chat room, the Author composes a poem along with all those people who have decided to chat with him. The poem is created with the use of the following procedure: First, the participating net surfers suggest the topics (titles) for the poem. The moderator (Michał Zabłocki) chooses one of the suggestions that have been sent in. Then, the chat gets ”moderated”, which means that the surfers will be able to see only the subsequent lines of the progressing poem on their screens. The surfers suggest and send their concepts of the first line to the moderator. The moderator chooses one of them (he is allowed to alter and leave a line for later on) and sends it back to the surfers. They see the first line – write the next one, etc. Some poems, written in this way, have already been granted awards in a few literary contests. For several years, the Multipoetry principles have been brought into effect through many repertoire songs of Grzegorz Turnau, Anna Szałapak, Beata Rybotycka, and recently – of Agnieszka Chrzanowska and Tomasz Mars. Agnieszka Chrzanowska, who sings the Author’s songs and remains a composer and singer of the “Piwnica pod Baranami” cabaret pub, has recorded two solo albums and won a lot of prestigeous awards. Tomasz Mars has prepared his own live-show and album ”A Male Bordello” based on “The scandalous poems”. It is a theatrical adaptation of a crazy poem for ”adult children”. These very interesting stage images, which have been directed by Paweł Szarek, create a fantastic background for the astonishing role played by Błażej Wójcik, one of the most talented actors of the rising generation. And the entire show is made even more splendid by Agnieszka Chrzanowska’s beautiful singing. The spectacle is a fussion of shadow play, pantomime, musical and exciting recitation. It is a pioneer initiative, intended to make verse come back to theatrical life in the present day. The first program which has been produced according to the MULTIPOETRY principles is the TV program entitled ”Telepoem”. This authorized program, directed by Michał Zabłocki and based on his poems, reveals the possibilities of adapting poetry for the television medium in a creative way. The first four episodes of “Telepoem” can be seen on the ”Canal+” TV Poland in 2003. In 2008 the project Multipoetry has entered a new stage in the process of international on-line writing and translating poetry. Under the eMultipoetry project we will now cooperate with poetry lovers in France, Spain, Germany, Italy and Greece. As a result, we will establish an Internet library of poems translated on-line. All those who would like to contribute to collaborative poetry translation are most welcome to participate in our chat. A special committee will select a poem out of the poems that have already been collaboratively composed. This poem will be then reworked into English — we will aim at preparing a literal translation that is as close to the original as possible. Our word-for-word versions will serve as the starting point for creating poems in English. Selected English versions of the original poems will be edited with the help of the moderator. 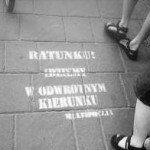 The process of translation involves careful consideration and analysis of various aspects of the Polish text. It also explores the possibilities offered by the English language to convey the original to English-speaking readers. To record translation transformations and developments, we will publish on our website versions of an original poem as we go along. Do offer your comments and suggestions — in this project we would like to demonstrate that translation is always a collaborative activity, an exchange between writers and readers, texts and languages, cultures and interpretations.